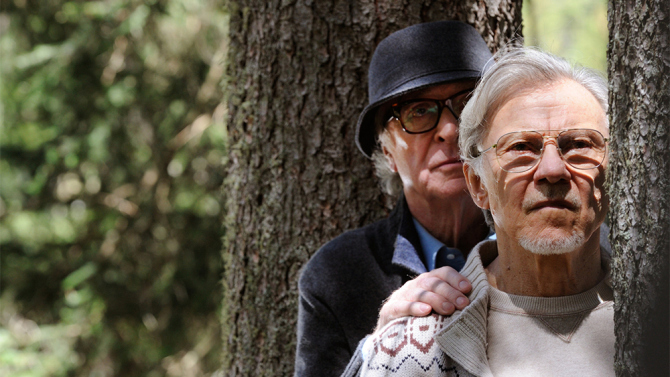 Fred (Michael Caine) is on holiday in a Swiss resort with his best friend Mick (Harvey Keitel). Mick is trying to write his latest screenplay, supposed to be his big oeuvre, together with a group of young writers. Fred is just trying to get some peace and quiet, when an emissary (Alex Macqueen) from the Queen of England approaches him to ask him to conduct his most famous symphony for Prince Philipp’s birthday, much to the surprise of the emissary and Fred’s daughter Lena (Rachel Weisz). Lena comes to visit but stays longer than planned when her husband and Mick’s son Julian (Ed Stoppard) announces that he’s leaving her. I was very reluctant to see Youth. I was afraid that the film would be all about a couple of old guys olging young women (the poster suggests nothing different). Fortunately the lusting was kept to a minimum and there was a lot about the film that I enjoyed. It won’t become my favorite film ever, but it was far from as bad as I expected. There is a strange mood to the film. Sorrentino works with a lot of interludes, long glances at things and people that are seemingly unrelated to the central story but which provide a nice background and mirror to his main characters. And he manages to build a rhythm with these things so that the film never loses its pace or its audience, much helped by the beautiful soundtrack the film is set to. That being said, I admit that I was more interested in everyone but Mick and Fred, the supposed protagonists of the film. I would have loved to explore Lena a lot more (and not just because she was played by Rachel Weisz), especially since her plotline included two of my absolute favorite characters about the film: Luca (Robert Seethaler), who starts flirting with her there and Paloma Faith (played by Paloma Faith herself) who is the woman her husband runs off with and who has one of the most hilarious cameos I’ve ever seen on film. I also wouldn’t have minded if Jimmy Tree (Paul Dano) had been more fleshed out, particularly as it could have potentially put the role he’s preparing for in more context. I felt that particular twist just came out of nowhere. But Sorrentino gives us all of these vibrant supporting characters (oh man, the massage therapist and her dancing, I loved her to bits) and focuses on the rich, old, white men in desperate search for meaning of their lives, possibly the most boring, most filmed about topic in cinema’s history. It also doesn’t help that the film doesn’t really treat his female characters very well at all, when it does concern itself with women at all in the first place. Add to that the fact that the film is obviously trying very hard to be deep and meaningful and never really manages to get past a superficial view of its own topics. It remains caught in tropes and stereotypes. It’s still engaging enough to make it entertaining, but it’s a film that thinks entirely too much and too well about itself. Summarizing: Worth it for what happens in the margins. This entry was posted in movies and tagged 2015, Alex Macqueen, Ed Stoppard, Harvey Keitel, Jane Fonda, Michael Caine, Paloma Faith, Paolo Sorrentino, Paul Dano, Rachel Weisz, Robert Seethaler, Youth by kalafudra. Bookmark the permalink.